Meghan Markle, the former cable TV actress, now formally called the Duchess of Sussex, announced she is excited to raise her child “gender fluid.” The 37-year-old social climber has been scolded behind the scenes time and time again for pumping her far-left political views in public, and now she is branding the baby-to-be as genderless, called a “theybie.” Well, Queen Elizabeth II isn’t amused, and she made sure the Duchess got a huge reality check. Of course, those ridiculous race-baiting remarks caused major blowback. “Perhaps the Duchess ought to have another glance at her husband Prince Harry – aka the Duke of Sussex. If she looks very carefully, she may notice that he too is overwhelmingly white and male. With luck, she’ll be so appalled by this shocking discovery that she’ll up sticks and move back to Hollywood, where she belongs,” reported James Delingpole via Breitbart. Now, the former D-List actress has decided to cause the 92-year-old Queen grief by announcing she’ll be raising the child as genderless. “Actress Meghan Markle has reportedly told friends she and her husband Prince Harry have plans to raise their child with a ‘fluid approach to gender’ that refrains from ‘imposing any stereotypes,’ according to sources who spoke with Vanity Fair,” Breitbart reported. “The Sussexes have already planned a gender-neutral nursery and opted for whites and grays over conventional blue and pink color ways, and this seems to be in line with Meghan’s ideas about how to raise children,” the magazine reported. 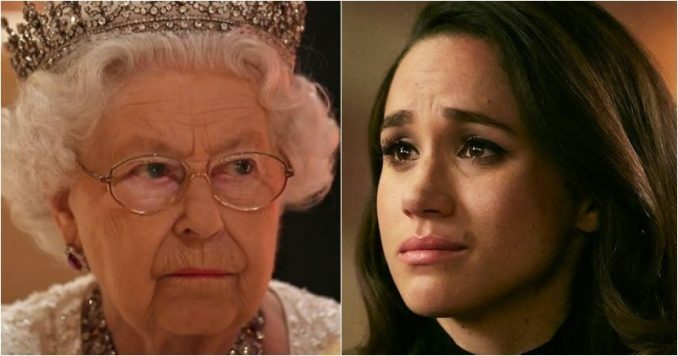 After the Cohen debacle, the Queen and her advisers knew Meghan Markle wasn’t a team player and had every intention of throwing in her far-leftist political views into the mix as much as possible. Now, with this “gender fluid” nonsense, it only cements the American grifter craves the limelight even if it causes distress to the Royal Family. Buckingham Palace trusts the British people along with those who revere the Queen around the world have Markle’s number as an interloper hellbent on serving her own needs. In the end, the Duchess of Sussex will be her own worse enemy. The public will permanently turn on her, and when Meghan looks for help, the Queen will shut the royal doors to Buckingham Palace on her for good.